This is an effect I discovered while studying the 1966 Batman tv series – Batman’s and Robin’s gloves seem to somehow trigger weird visual and sound effects when they moved their hands abruptly, Robin’s markedly more so than Batman’s. 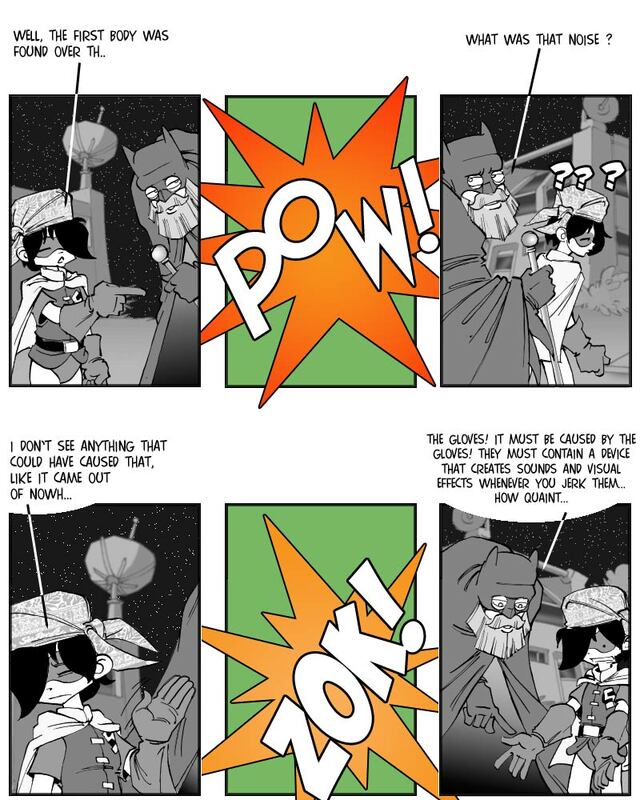 Mostly, this happened during fight scenes, leading some scholars to believe that these effects were actually supposed to stand for the sounds of the Dynamic Duo’s punches. There are, I believe, two conclusive arguments to be made against that opinion. Firstly, while the nonsensical words that were visible in those effects might be interpreted to stand for some kind of sound, those sounds would have been completely different from the sound of a punch. ‘Pow!’ would sound more like the burst of a gum bubble, and ‘Sok!’ like somebody drinking from a straw, for example. Secondly, the series shows Batman and Robin *clearly* not ever actually hitting their opponents – they just throw mock punches that miss their targets by a foot in the best cases. This is, in fact, so obvious that it *must* be intentional, probably to show how the psychological impact of a guy in a flappy batsuit alone is enought to bring down a hardenend criminal. With the ‘fight sound’ hypothesis out of the way, it’s clear that there must have been some kind of effects generator in the gloves, and I also think there’s a plausible explanation for it: After all, those were the 60ies, so Batsy was probably worried Robin could start to do drugs, and came up with those devices to provide him with a cheap substitute trip. Robin: “Pow!Sock!Zok!” Batman: “Stop it already, you wanker! And all this is only one of the special properties those costumes have, startling discoveries are still ahead. Next strip on Monday. Please vote.